Home Business Vu family fled Vietnam on small boat 35 year ago; they celebrate life, family, successful business in U.S. Vu family fled Vietnam on small boat 35 year ago; they celebrate life, family, successful business in U.S.
To know the story of Theresa Vu, owner of Theresa’s Alterations in Erlanger, and her husband Thinh, is to understand the history of the Vietnam War and the plight of its refugees. It is also a lesson in sacrifice, risk, hard work, and an unwavering hope for a better life. In 1975, after the fall of Saigon to the Communist North Vietnamese and Viet Cong forces, an estimated 65,000 Vietnamese were executed. In the wake of South Vietnam’s surrender, one million Vietnamese were sent to prison, or re-education camps, where roughly 165,000 died. Hundreds of thousands of others chose to face unknown dangers at sea rather than live under communism. Most fled between 1978 and ’79, but the exodus continued until the early 1990s. The numbers vary on the actual number of Vietnamese that fled their country by boat — makeshift boats, or fishing boats, that were never built to endure the vast waters of the sea. Some records estimate the number at 1.5 million. Many of the ‘boat people’ as they came to be known, died at the hands of pirates, starvation, drowning or coming ashore to an uninhabited island. History notes that roughly 10 percent of the Vietnamese refugees perished without ever reaching shore. The United States accepted 823,000 refugees — the Vus were among them. As the Vietnam War waged on, a young Theresa Vu lived in small village in South Vietnam with her middle-to-upper class parents. Her family, she says, placed great value on education. When she was in the eighth grade, her parents enrolled her in an apprenticeship where she learned to sew and master difficult techniques and craftsmanship. 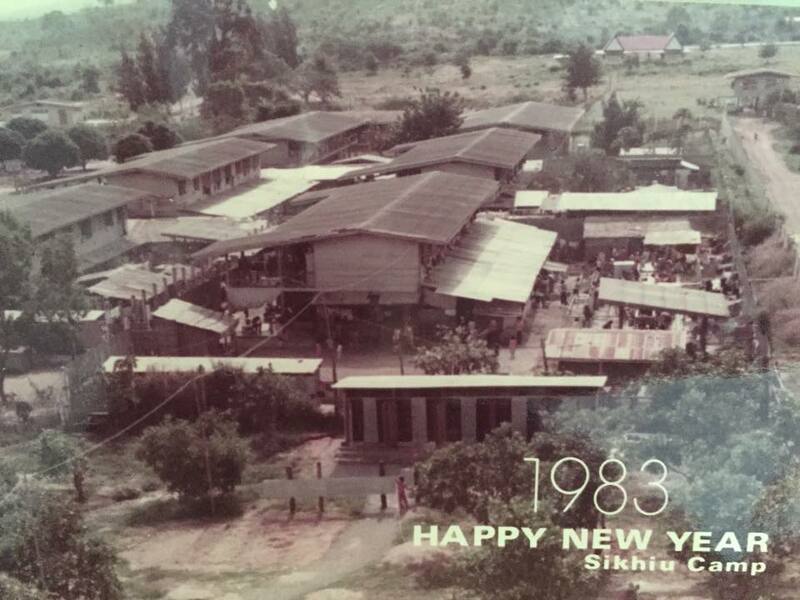 Sikiew Refugee Camp in Korat Province in Thailand: where the Vus lived and where Thanh was born. She spent three summers apprenticing with master tailors, where she learned bespoke, the custom-made style of sewing utilized by upscale tailors. Although educated and talented in her craft, Theresa had little promise of a bright future under communist rule. In order to escape, he says, smugglers would have to be paid, and once that hurdle was overcome, there was yet another deterrent – if police became aware of attempts to escape, it could mean imprisonment, or worse. “Sometimes we witnessed things like they were shooting a boat full of people,” says Thinh. In 1981, well aware of the risks of escape, the Vus secured their seats on a makeshift boat. Theresa Vu and daughter Thanh with Benedictine Sisters Sr. Thomas (left in black habit) and Sr. Silvester, in the courtyard of St. Walburg Monastery in Villa Hills. “The first three days on the sea were stormy,” says Thinh, who was 23-years-old at the time, four years Theresa’s senior. For a week, 25 people floated on the 30-foot boat before reaching Thailand’s shore where they were received by the Thai government. They spent three years in different camps in Thailand and the Philippines. “The process for a refugee is that when you have no connections outside of your country, then you’re physically stuck,” says Thanh Vu, the eldest of the Vus’ three daughters. With no relatives who had gone before them, the Vus had no one to join in another country. At the time, the U.S. was receiving the majority of Vietnamese refugees. In late 1984, the Diocese of Covington, through its Diocesan Bureau of Catholic Charities Social Service Bureau, arranged for the Vus to come to Covington. By then they were married and starting a family. Armed wiith masterful sewing skills, Theresa immediately landed a job at an alteration shop in Covington. “She had a trade to start supporting our family right away,” says Thanh. Meanwhile, Thinh decided to return to school and enrolled at Thomas More College. He later transferred to the University of Cincinnati where he earned a degree in engineering. The Vus family continued to grow and by the time they had their third daughter, Theresa was working in an exclusive upscale alteration shop in Kenwood. “During that time, we were just waiting for the right time for her [Theresa] to start her own business,” says Thinh. After thirty years, Theresa’s dream of owning her own business became a reality. In 2015, what was once Mary’s Alterations at 3068 Dixie Highway in Erlanger, became available when the owners, who were friends of the Vus, decided to sell the business. Theresa feels right at home at her shop. “I tell my husband I could stay here all night,” she says. During prom season especially, late night stints aren’t out of the question to complete a job. Thanh says her mother has a keen eye for quality fabric and understands where brand name designers such as Armani or Hugo Boss source their fabric. One of the services that Theresa’s Alterations is experimenting with is a partnership with J. Hilburn, a custom clothier for men. Thanh says gentlemen can come to her mother’s shop to select quality fabric for a made-to-measure suit. Like her father, Thanh holds a degree in engineering, but makes time to help her mother with her business, as well as tend to her own young family. The Vu’s other daughters are still in school. Gabrielle, attends UC’s Design, Architecture, Art and Planning program (DAAP) and freelances in fashion design, and Ileana is a junior at Notre Dame Acadamy. Education and hard work, says her father Thinh, is at the core of his and Theresa’s beliefs. What a wonderful story. Best to the Vu family always. Wonderful family! Congratulation on your ongoing success!